Here it is, my 52nd and final verse for my 2015 verse-a-week challenge. Looking back, it has been an enriching experience to write about each verse (or passage) as I attempt to commit it to memory. I don’t think I did as much as I could to memorize these verses long-term, so I might need to do some printing and flash-card-ing. I don’t think I would do too well on a quiz of all my verses, is what I’m saying. BUT meditating on Scripture is always a worthwhile exercise, and even if the words don’t all stay intact in the mind, the heart is never left unchanged. Almost a year after posting my first memory verse, I do feel different. I place more of a value on meditating on Scripture, looking at it in context, applying it to my circumstances, and sharing it with others. I can also see areas in which I can improve, specifically in the word-retention department. So I will work on that. I don’t think I will repeat this exercise in 2016, although I will be focusing on verses in other ways, but I am so glad I did it this year. This verse is perfect for this week. In my planning ahead I figured it would work well for the end of the year at that quiet time between Christmas and New Year’s. There would be time to reflect and time to look ahead. And that is true, but of course there is more. Hard things happen in the world and in our lives every year. That’s just the way it is. But at the end of this year, and maybe just today, I’m finding myself weighed down by it on a personal and universal level. Christmas, while joyful, can bring pain with the thought of those who can’t be with us. Remembering loss can make it hard to want to move forward, hard to know how. Also, reminders of the tragedies endured by people around the world are everywhere this time of year. Seeing and hearing those stories can make it hard to imagine better things coming in the new year. Of course there is hope with the start of a new year, and I do still feel that in my heart, but there is a downside to it that I’m noticing today. Something came to me in a time of sadness a couple of years ago as I found myself facing doubts about who God is and how he operates. I have to say, this was from the Holy Spirit and not something of my own invention. But I started to test doubtful thoughts or feelings of being upset at God with these questions: 1) Are the things I have known to be true of God still true? And 2) Do my feelings indicate that I am believing something false about God? I have found that when I ask myself these questions regarding what I believe to be true, worries and hopelessness fade away. Pain may linger, but there is comfort in the truth. If I am feeling like God doesn’t care or is withholding blessing because of something I’ve done, the Word and the Spirit call to my attention the truth of God’s care for me and his many gifts of grace (even if I don’t get what I think I need or deserve). If I say I believe that God is good, that his love endures forever, that he cares for me, that he works for the good of those who are called according to his purpose, then times of pain or fear or hopelessness are the testing ground for those truths. Because if they are, indeed, true they will bring comfort, peace, wisdom, maturity, understanding, and character (which includes action). But we must take the time to be still before God. Knowing these things about him will not come if we distract ourselves and place our focus on things of this world or creations of our own minds. This week my prayer for myself is to know and embrace God’s truth and character as the new year approaches. I pray that I will take time to be still and know who he is, then carry that truth with me as he inspires me to action. As always, please feel free to share your thoughts on this verse or anything I have shared. And Happy New Year! This image is the work of artist Ivan Guaderrama. Click the image to see more of his work. Finally over that cold! But I gave myself last Monday off from sharing my verse of the week. I was not only sick, but traveled 700+ miles with my husband to a middle school ministry workers’ conference which, while wonderful/encouraging/refreshing/inspiring, completely sucked the life out of this introvert. It was an entire weekend of people-time! Once the event was over we drove a few short hours to see my family in Tennessee, which was a special trip because my grandma was there visiting my parents and sister for a month. I enjoyed resting in safe fellowship with my family in the familiar place where I spent the majority of my growing-up years. There was eating, chatting, laughing, and even some shopping. Sidewalks were strolled upon. Backroads were driven. I was “home,” and now I am back. I figure if anyone is following along and missed the verse last Monday they could have easily used the track list from Seeds Family Worship to find “God is Unchanging” on the album The Character of God. That song goes along with Hebrews 13:8 which says “Jesus Christ is the same yesterday, today, and forever.” I pinned a cute image for it to my Verse of the Week pin board, FYI. It was in a Tennessee home studio some 15-odd years ago that I committed this verse to memory… for money. I sang on an album of memory verses– from the King James, no less– with a few other young people. From that session I can recall the verse from Hebrews along with Romans 12:1, although any other verses we recorded have since faded from memory. Maybe those two songs took us the longest? If you want to memorize a verse forever, singing it a few dozen times in a row with the words on a music stand in front of you and someone modeling how he wants it to sound after each take will do the trick! This week’s verse is the final track of The Character of God. It’s called “We Trust” and can be found in Psalm 20:7. I love that this verse is the last song on the album for a couple of reasons. First, a reasonable response to learning about God’s character is to trust him with our hearts, our feelings, our futures, and all aspects of our lives. Over the past 10 weeks the Scriptural passages I have looked at from The Character of God have pointed to God as Creator, Holy, Love, Light, Spirit and Truth, Wise, Faithful, Everlasting, Jealous, and Unchanging. While not entirely all-encompassing, this is an awesome list that I think does a great job of highlighting the most important facets of God’s character that have been revealed to us in Scripture. If we believe that God is all of those things, it only makes sense to trust him above anything else. God does not describe himself in one word or name, but by telling about his nature and his deeds (which prove his nature). Once these thoughts connected in my mind, I though of another verse: The name of the Lord is a strong tower; the righteous man runs into it and is safe” (Proverbs 18:10). I’ve heard that verse many times throughout my life and thought it was just another poetic thing to say the name of the Lord is strong rather than just saying God is strong. But the words mean more than that: the sum of all of God’s parts equals a trustworthy and strong refuge for all who seek the Lord. I want to say one more thing about Psalm 20:7. 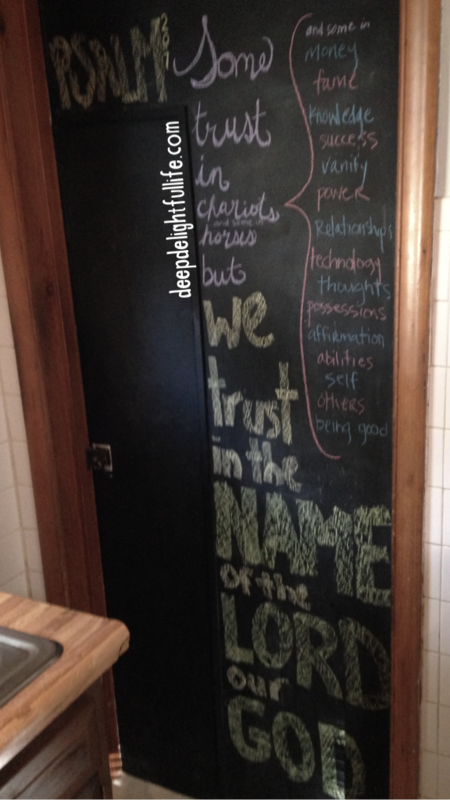 As I was listening to the song and working on the chalk lettering I noticed that there is a bit of an “us vs. them” mentality to the words upon an initial, surface reading of the verse. While there is some truth to that because some trust in God and some do not, it would be inconsistent with the character of God for the Christian to allow a feeling of superiority to take root from reading this verse. Even the faith it requires to trust God is a gift from God himself, and the other effects of trusting his “name” are also gifts– undeserved ones. It is not the ability of the believer, but the subject of our belief that allows us to trust in the name of the Lord our God who is Creator, Holy, Love, Light, Spirit and Truth, Wise, Faithful, Everlasting, Jealous, Unchanging, and more. Those who have accepted the free gift of salvation by Christ’s sacrifice can experience communion with God as he reveals himself to us by his Spirit through his Word, prayer, and fellowship with other believers. This is my own image, taken in my home. It’s a little blurry because I had to take a panorama to fit the whole thing in the picture! My challenge today will be getting through this post without crying, because I can’t help but think of two different classes of 3- and 4-year-olds shout-singing these words while smiling, looking around at their peers, and doing motions. I am also preparing to attend preschool graduation tonight, and will be saying goodbye to the little ones I was blessed to spend a few months with as a substitute helper in their class. Preschoolers typically prefer more rowdy fare for their action songs, and while there is some rocking guitar during the chorus of this song, it’s definitely on the mellow side overall. So I was always surprised that my munchkins loved it so much. But should I have been? As I pondered this verse from a grown-up perspective I felt like maybe I taught it to my kids out of context. It sounds very nice and happy: God, our father and creator, gives us good gifts. And this is true (look up Matthew 7:11 for a start). But the verses preceding 17 are about temptation and the results of sin, and the first part of the chapter is about enduring the difficulties of life. Chapter 1 of the book of James opens with that classic pick-me-up, “count it all joy, brothers, when you meet trials of various kinds” (verse 2). That opening may sound like a downer on the surface, but this first portion of James 1 is actually quite encouraging, full of assurance and truth and affirmation. Verses 2-6 are particularly rich, and verse 12 boldly affirms God’s heavenly reward for those who trust and follow him. James also wanted us to know that God does not tempt us. And his reasoning behind the statement is that God cannot himself be tempted by evil (13), and when humans are tempted it is by our own evil desires (14). Verse 17 confirms that God is unchanging and gives good gifts. To put it all together, he would not lure us to evil because that would contradict his intrinsically, naturally, permanent and unchanging good nature. When I taught this song, maybe I did disregard some of the context. And maybe when I try to dig really deep into the context of the passage, my brain hurts a little bit. I don’t fully understand the placement of this verse and all of what it means past what I have shared above. But despite my lack of understanding, I latch onto it just as my little preschoolers did. Why is that? There is something about the Word of God that draws us to Him. That something is actually someone, or God’s very Spirit. So even if we’re 3 years old (or 31 years old) and don’t feel like we fully understand the theological implications of a verse, it can speak to our hearts. This is the uncontainable, unstoppable, unchanging power of God. 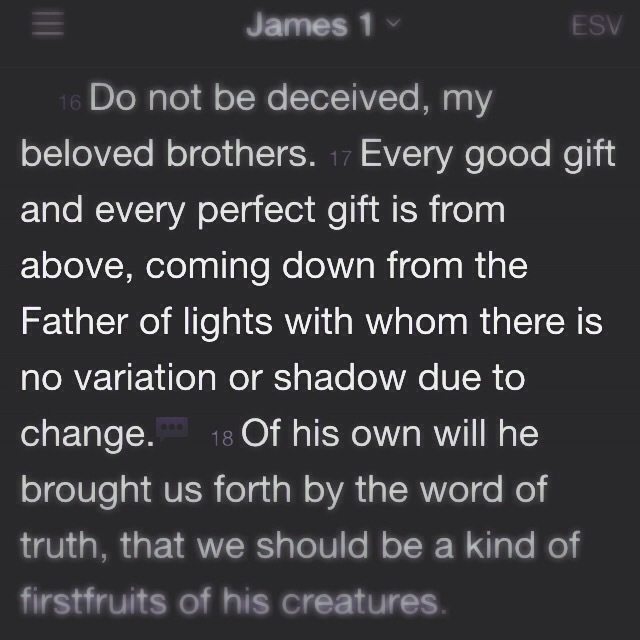 He does not change like shifting shadows. He is the same yesterday, today, and forever (Heb. 13:8, Mal. 3:6, Ps. 90:2). He acts out of his everlasting nature of love and righteousness, and his desire is for every person to choose to be reconciled to him through Jesus (John 3:16-17, Acts 17:27). Sometimes we may “feel” a verse before we fully understand it. And that is alright! God knows our limitations- that’s why we need salvation, and were given a perfect Helper in the form of the Spirit to guide us as we seek to know God better. I would love to hear from you– how does this verse or passage encourage you? Do you have any experience with being drawn to a verse even if you don’t fully understand it?